Scott Louis Brady passed away December 20, 2014. He was born March 3, 1959 in Norwalk, Calif., to Bill Brady and Helen Lynch. 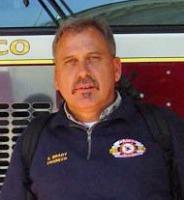 In 1989 he moved to Placer County and found his true passion of being a Firefighter. He devoted nearly two decades to the fire service. In 2009 he moved to Santa Cruz, Calif., and spent his remaining years surfing with his best friend, his service dog, Meggie. His kind heart and playful energy left an impression on anyone who was lucky enough to cross his path. He is survived by his three children, Cheyenne Brady of Grass Valley, Paige Kadella of Menifee and Danner Brady of West Sacramento, as well as his four grandchildren. Service will be held at Placer Hills Fire Dept. 16999 Placer Hills rd. Meadow Vista, CA on January 31, 2015 at 2:00 pm.